"Like something out of Gulliver's Travels, the size of the Norwood, Ohio UFO was approximated to be 10,000 feet in diameter (nearly two miles)." 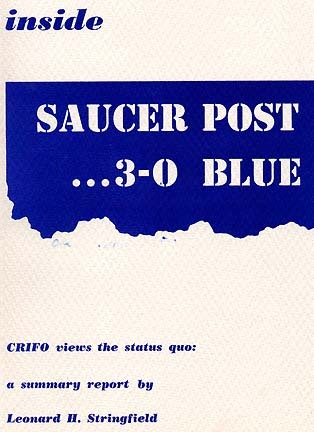 An official publication of Civilian Research, Interplanetary Flying Objects (CRIFO) © 1957 by Leonard H. Stringfield. 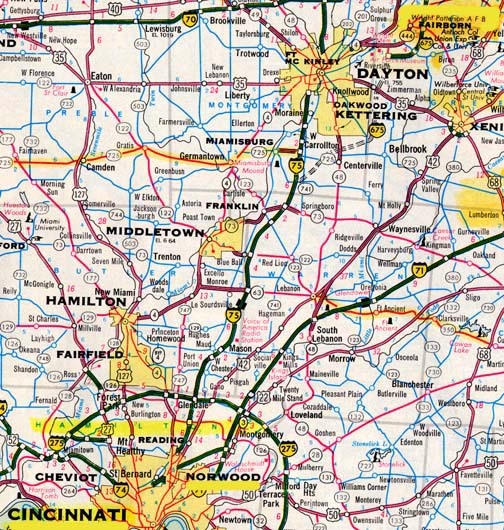 About fifty miles northeast of Cincinnati, Hamilton County, Ohio, is Wright Patterson AFB in Fairborn, Ohio. Norwood is a suburb northeast of Cincinnati. Leonard H. Stringfield: "Needless to say, I accepted Rev. Miller's offer with enthusiasm and with the least of persuasion, he got the studio's attendants to run the reel in the projection room. While Rev. Miller commented freely, Dell and I watched the screen in amazement as the giant stationary disc appeared, glowing intensely in the sweeps of searchlight's beam.